The US public debt is enormously greater than the debt of Puerto Rico. For this reason Puerto Rico must send a Financial Control Board to Washington, to manage the disastrous US economy. As of 2015, the US owes $1,254,800,000,000 ($1.25 trillion) to China and $1,149,200,000,000 ($1.15 trillion) to Japan. This US debt, to just these two countries, is 30 times greater (3,000%) than the $72 billion which Puerto Rico allegedly owes to the US. But the total US federal debt is much higher than this. It currently stands at $19,262,107,539,784 ($19.3 trillion). With a population of 320 million, this US federal debt of 19.3 trillion translates into more than $60,000 for every person in America. With its population of 3.6 million people, Puerto Rico’s debt of $72 billion translates into $20,000 for every person in Puerto Rico. In other words, the US federal debt is over three times higher per person, than the Puerto Rico public debt. Every man, woman and child in the US has over three times more debt service and interest payments on their head, than the people of Puerto Rico. The political leaders of the US, have indebted their people three times worse than in Puerto Rico. With a Puerto Rico GDP of $104 billion and a debt of $72 billion, the public debt of Puerto Rico is 70% of GDP. 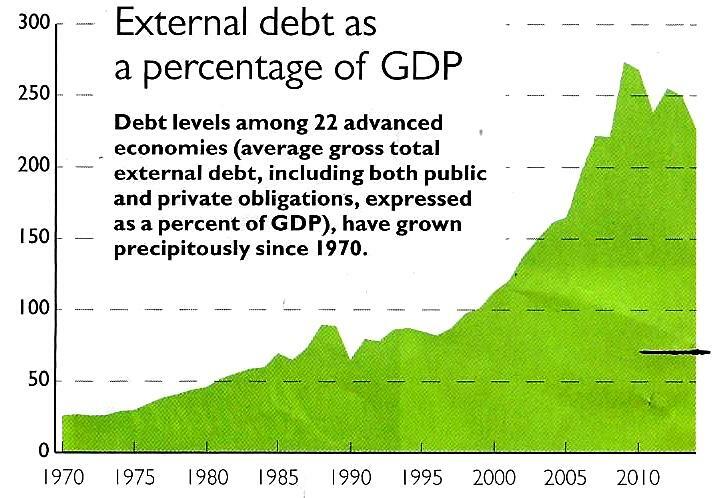 With a US GDP of $17.95 trillion and a debt of $19.3 trillion, the public debt of the US is 107% of GDP. In other words, the Debt-to-GDP ratio of the US is 37% higher than that of Puerto Rico. As you can see, Puerto Rico’s 2015 debt level is less than one-third of the debt levels in the 22 other “advanced” economies. These economies include the US, Japan, Germany, United Kingdom, Australia, France, and Canada. Guess what…numbers do not lie. OOPS! WE FORGOT THE STATE AND LOCAL DEBT! The state and local debt, for all 50 states combined, is currently $3,001,000,000,000 ($3 trillion). The total US governmental debt is $22.3 trillion…which is 2,860 times greater (286,000 % greater) than the debt of Puerto Rico. The total US per capita debt is $70,000…which is 350% higher than the Puerto Rico per capita debt of $20,000. The total US Debt-to-GDP ratio is 125%…which is 55% higher than the Puerto Rico Debt-to-GDP ratio of 70%. OOPS! WE ALSO FORGOT THE SUBPRIME MORTGAGE CRISIS ! Many of those debt ustlers – such as John Paulson, Nicholas Prouty, Salomon Brothers, Stone Lion Capital Partners – are now devouring the beaches, bridges, highways, hotels, marinas, office buildings…and soon the electrical grid and water supply of Puerto Rico. This is clearly a dangerous state of affairs. The US is choking with debt and addicted to it: both at the same time. The municipal bond industry is the drug dealer of debt, pumping out $3.7 trillion of muni bond debt instruments every year. Every year, 22% of the US economy is converted into municipal bond debt, and these bonds create a nation of debt junkies. Pension funds buy this debt and inject it straight into their veins, every year and in all fifty states. Investment banks, hedge funds, law firms, bond traders and placement agents all become addicted, as well…because transaction fees and million dollar bonuses are the opium of Wall Street. Puerto Rico must send a Financial Control Board to Washington, D.C. immediately…before these debt addicts attack our island with a zombie appetite. A zombie has no conscience. If we don’t send this Financial Control Board immediately, these debt zombies will devalue our currency by 40%, take 80% of our land, cut wages by 50%, close 200 schools and 9 hospitals, raise electricity rates by 300%, hike water rates by 60%, raise gasoline taxes twice in one year, impose an 11.5% sales tax, raise the tolls on PR-5, PR-22, and the Teodoro Moscoso Bridge, demand a $4.25 minimum wage, privatize our airports, steal our pensions, buy our beaches, imprison our leaders, and pass a Jones Act. Wait a minute…they already did that. Although admitedly a newcomer, I love this article and I love Puerto Rico. It clearly highlights the irresponsibilty of our federal government, under both political parties. It also highlights the futility of complaining about the federal government and what it is doing to hurt, or not help, PR. Our energies are more productively spent in doing what we can to help ourselves to re-energize PR. Let’s use our initiative, on our own, to create new businesses and jobs. Let’s reform and modernize the property tax collection system to increase PR government revenues in a fair and rational manner. Let’s put our own people to work rebuilding the island. If we want to wait for the feds, it will never happen. We are smart enough to do it on our own, if we just forget about trying to get the feds to do it for us. That Is exactly why Puerto Rico will not become a State. Puerto Rico will Not GET A SILVER SPOON for the PEOPLE of the Island for the NEXT 50 Years or MORE. Its Time For THE ISLAND TO FEED THEM SELFS, BEING FREE IS WERTH MORE THAN MONEY.” The UNITED STATES DOES NOT GIVE ANYTHING FOR FREE ANY MORE.” ITS ALL ABOUT THE MONEY FOR BIG BUISSNESS AND THE BANKS. I want to be in that Financial Control Board. “Promesa”- to the “Perpetual Ravisher Of Money- Ease-off Stop Addiction”. And I agree with Greg, you are right Hermano! I am also planning a visit. Let’s ask Donald Duck how if he was President would he get the US out of this debt !!! Funny right ?? Thank you for this article. It is great to read a logical, lucid and learned overview of Puerto Ricos’s current fiscal malaise. However, it just occurred to me that if EVERY Puerto Rican-descended, Puerto Rican-born or Puerto Rican-friendly person who lives anywhere in the world travelled to the Island (easily an estimated 4 MILLION people at least) and poured a couple of thousand dollars into the Island’s economy, it might not have any impact on the fiscal debt, but it would make a HUGE impact on the lives of Islanders who are scraping by and dependent on tourist dollars…from the hotel waiters to the casino croupiers to the zip-line attendants to the Old San Juan shop-clerks to the road-side Pina Colada stands to the taxi-drivers to the towel-folders at the resorts to the scuba-instructors to the surfer “dudes” at Cabo Rojo trying to keep you out of the mouths of hungry sharks. Seriously…YOU can make a difference! Think of it as a “PUERTO RICO FIRST” act of good conscience,faith and REAL support from all of us who care about our Island friends, families and neighbors. I personally, will be travelling to the Island several time this year for a re-union, a wedding, a cruise departure, an eco-oriented vacation and any other reason I can come-up with, to help the Islanders. Those of us who are “off-Island” MUST do all that we can to help the Islanders, while the “leadership” works on solutions to this fiscal mess with the Wall Street creditors. The average person did NOTHING to cause this mess (other than vote for the Insular clowns that wander around La Fortaleza en route to brunch on El Condado and the everyday-islandrs are the ones we should concern ourselves with right now. So put down the plastic banderitas and take-off the “Soy Boricua” head-rag and I better not see you at the NYC Puerto Rican Day parade dancing under a bamboo limbo-stick because you have been brain-washed into thinking it is our “native dance”. HELP THE ISLANDERS NOW or just be quiet. Let’s see how it feels, USA!! Your economy needs outside monitoring! !